The Feb. 26 rally in support for fair elections has the opposition still hoping to establish the dialogue with the authorities a week ahead of the presidential vote. Another rally, the Big White Ring, organized by the Russian opposition on Feb. 26 turned into a large-scale flashmob attended by thousands of people who once again took to the streets to support fair elections before the 2012 presidential election. In an interview with Ria Novosti, leftist leader Sergei Udaltsov said that participants succeeded in creating a human chain around the 15.4-kilometer (9.5 mile) Garden Ring in central Moscow. According to police, about 11,000 opposition activists participated in the event, but the organizers and rally attendees claim that the demonstration attracted up to 40,000 people. According to the organizers of Sunday’s grassroots protest, this kind of a demonstration was chosen because it didn’t require permission from the Moscow City Hall. 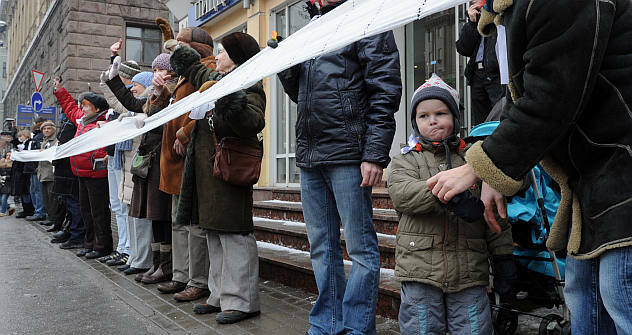 Theoretically, about 34,000 people would be needed to “lock” a human chain along the Garden Ring according to figures given on the the rally’s website, 26feb.ru. Many prominent figures attended the demonstration, including opposition leaders Alexei Navalny, Vladimir Ryzhkov, Boris Nemtsov and Ilya Yashin; TV hosts Tatiana Lazareva and Ksenia Sobchak, and prominent Russian writer Boris Akunin. In addition to the human chain, a car rally took place on the Garden Ring at the same time, with drivers circling the chain and cheering its participants. It was the third rally of this kind and, according to police, it brought together fewer participants than the previous ones. According to organizers, up to 60,000 people participated in each car rally, whereas police put the numbers at 30,000 per rally. Opposition supporters weren’t the only ones taking to the streets on Saturday. Supporters of Prime Minister Vladimir Putin marched with posters reading: “Putin loves everyone” and chanting “Putin and Victory!” According to Kommersant FM radio, some of them attempted to break the human chain. It is not the discontent of the [unsatisfied] minority, Korgunyuk emphasized, but an attempt to express civil position that comes from the whole community that doesn’t want to be prevented from participating in Russia’s politics.